Congrats to masterbrady on being the lucky winner of the Ryan McMahon 2018 Topps Gallery RC Auto. Once masterbrady sends me their mailing address, I will ship this card ASAP. Thanks! Congrats to Thomas Coleman on being the lucky winner of the Charlie Blackmon 2017 Topps Update Series All-Star Stitches Event-Worn Jersey. Once Thomas Coleman sends me his mailing address, I will ship this card ASAP. Thanks! Congrats to James Sanders on being the lucky winner of the DJ LeMahieu 2016 Topps Triple Threads Unity Jumbo Jersey Auto Emerald Parallel #’ed/50. Once James Sanders sends me his mailing address, I will ship this card ASAP. Thanks! 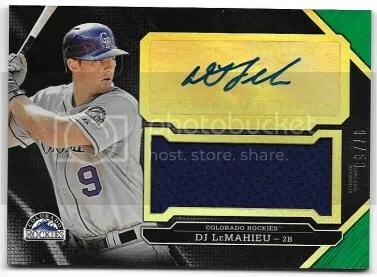 Congrats to Brian C on being the lucky winner of the Troy Tulowitzki 2012 Playoff Prime Cuts Jersey #’ed/99. Once Brian C sends me his mailing address, I will ship this card ASAP. Thanks! 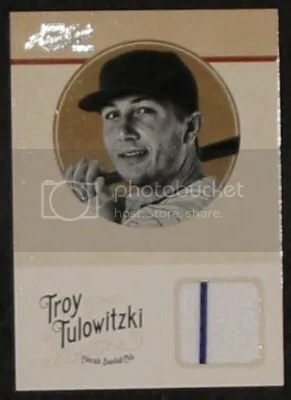 This contest is for a Troy Tulowitzki 2012 Playoff Prime Cuts Jersey #’ed/99. Good luck!!! It was the summer of 1996, and I had just really gotten into collecting. My dad and I decided to go see a Harrisburg Senators baseball game one weekend. I had never been to a minor league game before so I didn’t know what to expect. When we got there I saw a lot of people, food stands, and stuff to buy. We went over to one of the souvenir stands and I picked up a hat, program, and team set. The team set featured a player named Vladimir Guerrero, which actual became my first small exploration into prospecting. After we purchased our souvenirs we found our seats and began to explore the program and look at all the advertisments. That day, the Harrisburg Senators (Montreal Expos) were playing the New Haven Ravens (Colorado Rockies). Our seats were closer to the Ravens dugout and we could watch them practice swinging their bats. I remember before the game there was a fan with an album full of minor league team sets that he would take to games to have the players sign. After awhile we got hungry and ate some hot dogs. What happened after we were finished eating really surprised me. One of the Ravens players had broken a bat, and when they picked up the broken bat they brought it over, and swung it around the fence to me. I couldn’t believe it. They gave me a full size game used bat. It wasn’t even that broken, just a small piece of split wood off of the handle. I never found out who used the bat. 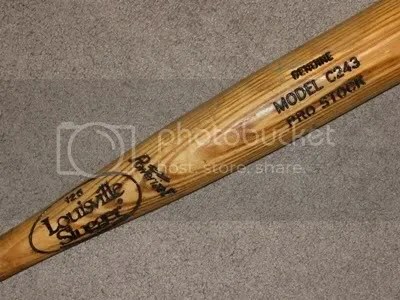 On the bat’s barrel it says, “GENUINE MODEL C243 PRO STOCK”, and on the bottom of the bat knob there is a number 15. I would say that this was a great way to start my collecting career. Here are a few photos. 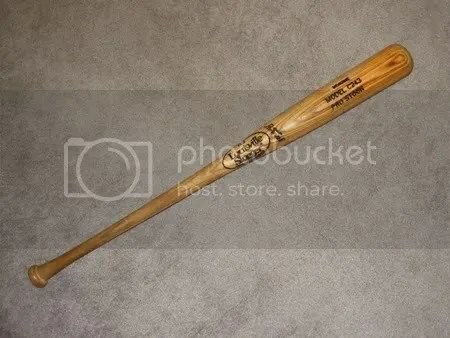 Maybe you can help me find out who used the bat.